Peter Stevlingson and I have bought a lot of chess books over the years. My boys won a few of them. Rather than just having them gather dust, we thought we would offer them out to parents who would like to check them out. There are not only some really great books here, there are also some DVDs and even a couple software packages. We're going to try this out. We suggest a $1 donation to the club to take out a book, and we suggest a 2-week return period. This is a great way to check out an awesome book, and to learn what sorts of books your child (and your family) like best. If books are lost or seriously damaged, we ask that the parent pay for its replacement. Of course, we ask that the materials be respectfully handled so that they may be used for a good time into the future. Many of the books are paperback, so this is especially important that they be well handled. To Check Out: send me an email of what you would like to check out, and I will enter your name on the library sheet (which we can all see) and I will bring the item to class. Thank you. 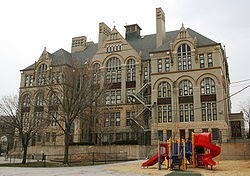 New Tournament on Calendar - Golda Meir - Sat Feb 22 -Every year, the city of Milwaukee chess is dominated by Golda Meir school - they have a great program and some leaders who know about the benefits of chess. This is a fun UNRATED tournament for kids of all ages. There is a K3, K6 and K12 division. EMAIL ME with child's name, school, and grade if you would like me to register you. Only $10, and you pay at the school the day of the tournament - but you need to email me first before 2/19 so I can pre-register you. Registration is by school, as is the usual case - clubs not allowed for this one. CLICK HERE to view the tournament flyer, hope you can make this one at Golda Meir. Nothing after this until March, when we have three tournaments in a row- Randy's New Berlin tournament at Elmwood (3/15), the State tournament in Oshkosh for some players (3/22-23), then the big Grade Level tournament on 3/29. CLICK HERE for full results from Star of Bethlehem. Highlights: NOTE: This was a USCF-rated tournament so please go to uschess.org and click on players and ratings, player lookup, and you can see your ratings, and how they were either established new OR affected by this tournament! Still need work getting full teams together for tournaments - thanks to the parents who have volunteered to help with each school. We'd like to form little groups of friends for each school (and each division) so we have teams of 4 or more for each tournament we play in! Muskego High School took the K-12 fairly easily with 18.5 points (possible 24). High scorers were Evan 6, Jason 5, Rachel 4, and Reid and Jake with 3.5 each. Lake Denoon K-12 with Jack Bognar, Brian Mark and Elliot Bognar took 5th place with 8 points. Lake Denoon K-6 did extremely well, in the running all the way against a tough Brookfield Academy team, ending up in 2nd place. Top finishers: Will Schantz led the way with 4.5, Matthew Redlinger kicked in 4 wins, and Kyle Jain added 3.5 and Aaron Gibbs 2.5 to the effort. Bay Lane did great with only 3 players, finishing in 5th place ahead of some teams with 4 or 5 players. Nice job Alyssa Przedwiecki (4), Noah Gover (3) and David Bundy (3)! In K-3, we really didn't have any teams. Mill Valley we had two players who both did EXTREMELY well- Gavin Joers with 4.5(!) and Nelson Klein with 4 wins. With a couple more players, we would have been up towards the top! Tess Corners also had two players compete, Alex Swieszynski (3) and Derek Stathus (2). In K-12, Evan Seghers continued his roll as our top board, going a perfect 6-0 and winning the K-12 division. Jason Markowski also did very well, losing only to the tough John Hegelmeyer, going 5-1 and taking 3rd place. In K-6 division, Will (4.5), Matthew (4), Alyssa (4) had "red division performances" and Kyle did well again, taking 3.5 points. Several strong performances by newcomers in this tournament! Noah Gover took 3 points, David Bundy 3 points (nice recovery! ), and Aaron Gibbs and Nick Schuster also did well. In K-3, newcomers Alex Swieszynski (who just got his Blue wrist band) did really well, taking 3, as did Derek Stathus who won 2 games. Keep practicing guys! Great to see you doing so well. Gavin Joers took 4.5 in K-3, one of the best performances in K3 this year, and Nelson Klein added 4 wins to his impressive resume. Great job one and all!! Hope to see many of you at Discovery World this weekend! Still working on calendar for February. We will have a tournament we'll attend! Our home High School Chess vs. St Mary's is Canceled for Tuesday, we'll announce a make-up. Class Wednesday should be ON however. Chess clock/set sale - one day only! Matt alerts me- there is a fantastic one day deal at Wholesalechess.com for an Excalibur Gametime II clock AND/OR their Quality Club Chess Set Combo. The Gametime II clock is $27.99 (Normally $40) and the chess set combo is a mere $8.99 (Normally $19). As stated on the flyer for the IAC tournaments, which are usually USCF rated, "USCF membership is required for all sections. It is recommended that memberships are purchased in advance at www.uschess.org to facilitate onsite registration and check-in. In addition, three month discount USCF memberships may be purchased onsite. The membership includes a three month subscription to Chess Life magazine." The Star of Bethlehem tournament is USCF rated. I recommend the annual membership which you can sign up to on the uschess.org site, then just bring this number to the tournament (or you can look it up online again with a smart phone if you forget). The rating is something you carry from year to year. A beginner is usually about 100 after first tournament. A master is 2,000+. A solid high school player will be around 1,500. Magnus Carlsen, the world champion, recently achieved a 3,000 rating. Interestingly, our own Mr. Dan Gomoll has created an "app" called "chess rating" on Apple's App Store which you can download for free if you have an iphone. It lets you look up a player's USCF rating. The Wisconsin Scholastic Chess Federation, run by Bob Patterson-Sumwaldt, has its OWN rating system, similar to the USCF. When you play in a WSCF rated tournament, you automatically get a WSCF rating. Many of our players have one on Bob's books from previous years. It doesn't cost anything, but is meaningless outside of the WSCF events. 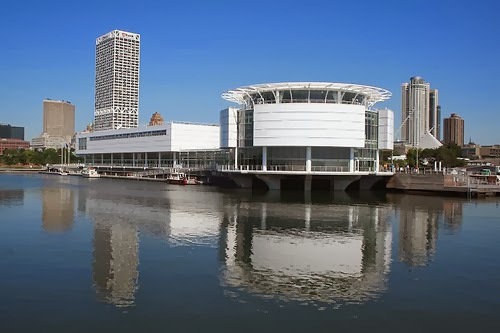 At Discovery World, the tournament is based on a combination of grade level AND rating. If a player has both USCF and WSCF ratings, the rating that is used is the HIGHER one. If a player has only one of the two, that is used. If a player has neither, then only the grade matters. K3 U300 means "Grades K through 3 AND the player has rating Under 300." If a 2nd grader for example has a rating of 500, then they would not qualify for this division and would have to play K6 U600 division (it may accidentally say "WSCF U600" on the registration page, but it is a K-6 only division). Similarly, if a 5th grader had a rating of 1000, they would not qualify for K6 U600 and would have to play in WSCF K-12. Let me know if you have any questions about ratings. USCF is the more useful (and universal) measuring stick. Last Call for Star of Bethlehem! Thanks to all who have signed up for Star of Bethlehem. Please go to http://ia-chess.com/registration/participants.html?id=27 to see who is signed up - if you'd asked me to sign you up, please make sure you are on the list! Hope I didnt forget anybody! Just pay at the door if you're registered - if not just email me at seghers@gmail.com and I'll get you registered. Remember, you can also just register at the door on Saturday morning. Costs $5 additional. For Discovery World, parents can sign themselves up at their site http://wisconsinscholasticchess.com ... email me if you have problems. Exams caused us to lose 3 out of our normal 10 players! Thanks to Will Schantz and newcomer Kyle Jain for filling in for two of those spots. We didn't have time to find a third, since we didn't know about the last missing kid until Tuesday. Ugh. The very tough Troy Zimmerman-led Brookfield Academy varsity chess team edged Muskego High last night, winning 3 out of 5 games and earning a win 25-15. Winning for Muskego Varsity was Jason Markowski on board 2 and Rachel Gomoll on board 5. This was our varsity team's first loss since joining the conference 2 years ago. Brookfield is that tough. 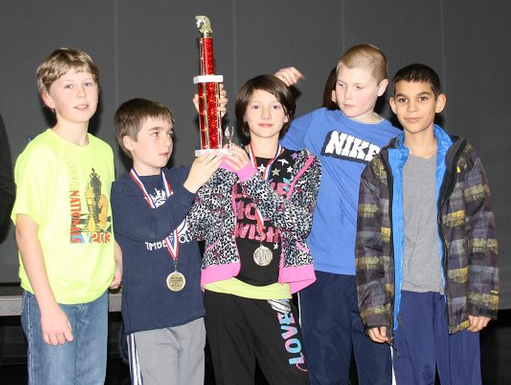 This tournament will place your child based on their USCF rating. If you have a K-3 child over 300 USCF, they will be moved to K-6 (and knowing this, you should register them there). If you have a K-6 child rated over 600, you should register them as K-12. Please register and pay online for your own child - there is a "PayPal" button there which also takes credit card. This tournament requires prepayment. Beginners- please watch these videos! When we do testing for White and Blue, I always ask the kids "have you watched the videos on the website?" and about 70% of the time they have not. These videos contain most of the information they need to get to the BLUE level! To see our video library, just click here, or see the navigation on the right hand side of our MSCC site. Thanks! Brookfield academy on Tuesday for our high school team- please RSVP so I make sure we have full team. Wednesday night- class with Matt and Danny. Saturday- tournament at Star of Bethlehem! Register online at is-chess.com! Congratulations to all the kids who jumped into their FIRST tournament! The non-rated divisions are a great way to do it. Congrats to: Talan Noel, Evan Stachowiak, Joshua and Ben Kierzek, Anoushka Prasad, Isaac Terrence, Noah Gover, Dylan Cleveland, Steven Wauer and Kyle Jain (sorry if I got anything incorrect here or missed anybody!). In K-3 non-rated, Congrats to Tess Corners 2nd grader Talan Noel for winning 3 games in his first tournament! Congrats also to Mill Valley 3rd grader Evan Stachowiak for starting out very strong and taking 2.5 games also in his first tournament. 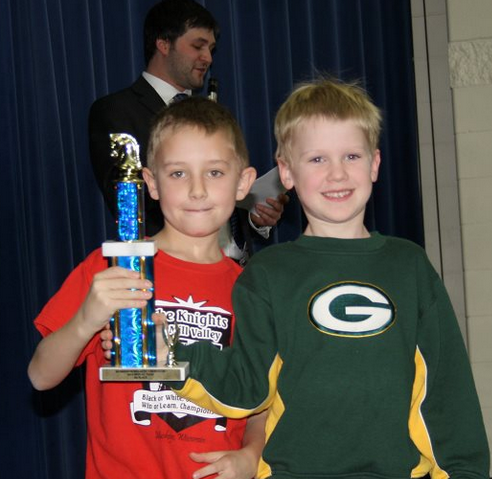 In K-3 rated, congratulations to Mill Valley 3rd Grader Gavin Joers who won 3.0 and raised his rating almost 100 points! Dependable 2nd grader Nelson Klein also took 3 wins for Mill Valley. 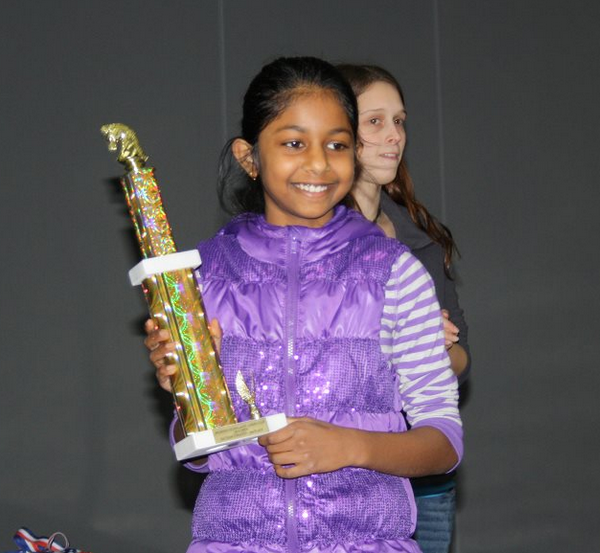 In K-6 non-rated, congrats to BLMS 5th grader Anoushka Prasad who took home the 3rd place trophy in her first tournament! Tess Corners 4th grader Isaac Terrence also did very well, winning 3 games in his first tournament. In the K-6 rated, congrats to Kyle Jain, who in his first tournament, won 3.5 and earned his Red Division bracelet. That has happened only a few times in the existence of Muskego chess. Kyle's opening rating of 1100+ is the 2nd-highest opening rating of any Muskego scholastic player (at least that I'm aware of). Keep it up Kyle! Keep studying and becoming stronger. Congratulations also to his LDMS teammate, Will Schantz, who won 3. Alyssa Przedwiecki also did well taking 2.5. Congratulations to Evan Seghers who won the K-12 rated division with a perfect 5.0. Our group of kids Evan, Reid, Jorin, Jason, Rachel, Kolt, and a few others have been playing together now for many years. They are always tough. Great tournament for Jorin McGuire who won 3.5 including against Jason and Reid, and lost only to Evan, raising his rating almost 250 points! Good job Jason Markowski (overcoming a tough start) to win 3, and good job Kolt Otterbacher also winning 3. The FIRST TOURNAMENT WIN is sometimes hard to come by. Many kids back out of chess before ever getting it. Congratulations to 4th grader Jack Mallon who stuck with it and won a great game at LDMS. He has a great attitude and will win more and more as he gets more experience. 4th and 7th grades are the hardest because you're playing against mostly older/more experienced players. 8th grade is also hard, and this is the year most kids drop out of chess. Some players will have a great tournament, then a tough tournament. It happens. When I think "chess is getting easy!"... that is the time I start to lose a few games. It's all about practice, and playing people who are better than we are. Keeping an open mind, and keeping our EGO out of it. Don't get too upset when you lose and don't get too happy when you win. The goal is LEARNING and IMPROVING. Not winning. I have been prouder of kids who lose a few games but keep fighting (as did Jack Mallon and Cole Zettel yesterday), than kids who win easily without trying, and are lazy about studying. The journey of learning never ends! The great masters all knew this. If you're not winning yet, there's a reason. The answer is almost always studying your losses and seeing where you went wrong - take notation! Then you can replay your games later. Even if you notate just the first 20 moves.. that is usually enough to see where things went wrong. For TEAMS, congrats to: MHS for winning k-12, Mill Valley for taking 2nd in K-3 NR, MV for taking 4th in K-3, Bay Lane for taking 2nd in K-6NR, MV for taking 3rd in K-6NR, Lake Denoon MS for taking 2nd in K6 by a HALF POINT against Brookfield Academy, BLMS for taking 5th in K-6. We need one parent volunteer to pull together a team for each school! We came very close in several divisions but lacked the number of players - this will be important in larger tournaments especially. WHEW! That's a lot to read, sorry. Thanks again to all who attended and supported Muskego Chess! 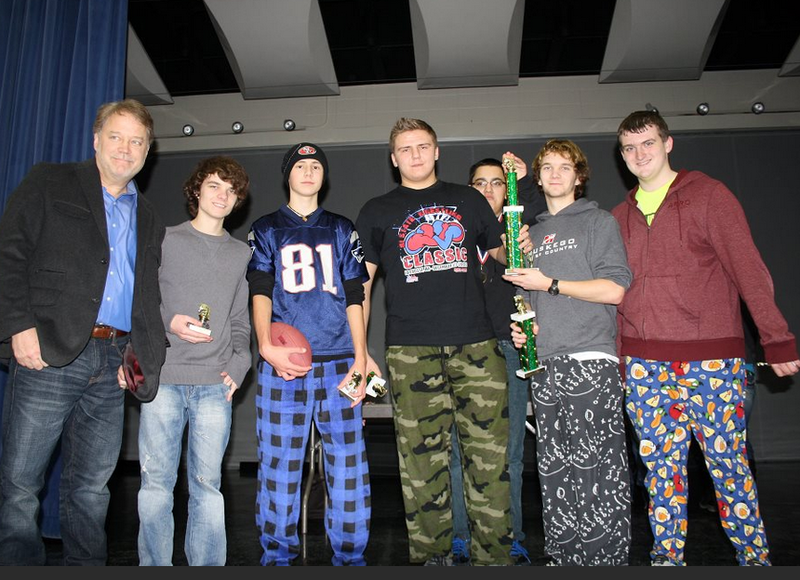 Our high school chess team defeated Arrowhead on Tue 1/14. We won 8, lost 1 and drew 1. Varsity won 37.5 to 2.5 and Jayvee won 20-5. Way to go team! Next week we travel to the very tough Brookfield Academy team, where every single game we will be underdogs! Lots of good things happened at Lake Denoon Middle School, in our own tournament! I will post results later today as time allows. For now, THANK YOU to all who attended, and a BIG thank you to those who volunteered their time, or snacks, or both- especially Glynis, Dan and Lori Schantz, Leah, Dan G, and others who gave so much. Another huge thank you to Mark Nagy and the custodial staff who were extremely helpful getting things ready for us, set up, clean up, etc. Things ran very smoothly! Not only does this tournament "keep us on the map" but also generated some funds to keep our club rolling. 1) Nicolet High School is an easier (WSCF) tournament for anybody who wants some extra practice (we are not attending as full club). wisconsinscholasticchess.com is the site to sign up for just that one tournament. 2) Star of Bethlehem tournament is our next "official" tournament on 1/25 - register today on ia-chess.com (Mr. Matt's site), or email Mr. Seghers (seghers@gmail.com) if you would like to play. We will of course be having class on 1/15 and 1/22 as usual. There IS chess tonight at MHS! See you then! 630-8pm - normal class with Matt, Danny, Mark instructing different sections. SIGN UP NOW - Lake Denoon tournament 1/11 !! Less than one week to go til our OWN chess tournament, on Sat Jan 11. If you have been thinking about a tournament (especially if you are blue, or close to blue division), NOW is the time! We have added two UNRATED divisions for K3 and K6! We also have USCF rated divisions for more experienced players. If you are in doubt, go with unrated. You don't have to sign up for USCF if you play in an unrated division. Tournaments are where we get the chance to play meaningful games in a well-structured environment. Often times, this is where kids really "catch the fever" of chess. This is also a great time to spend time with other kids in the club, and to receive some one-on-one mentoring from some of the instructors, parents and older players. PLEASE SIGN UP ASAP for our own chess tournament, hosted by Lake Denoon Middle School! If you like, email Mr. Seghers seghers@gmail.com with your child's name, grade, school and I will sign them up for you. HERE IS HOW YOU SIGN UP - Either: <- Register Now!! Registration closes soon! Please let me know if you have any questions. Thank you. Due to inclement weather, our match at Brookfield Academy is cancelled. Tentative rescheduling is Jan 21st where we had previously scheduled a Bye. Thanks to those on Chess.com!! Thank you to those players who have joined Chess.com and have shared their ID with me. I have gone out there and placed comments on some of the games. Because we have such a large club and so few instructors, we will be spending the most off-class time with the players who show EFFORT and who attend tournaments. Chess.com is a great way to improve your game, and win or lose, it shows effort. Remember, Chess.com starts everybody at 1200, and you will lose a lot of games before you start to win. See these losses as lessons. Replay your LOSSES more than your wins. It's hard, but this is how you learn. Be proud of the games you are playing - not just the games you win. We don't have access to room 243 on the 14th or the 28th, so we'll have our high school matches in the cafeteria on those days. This affects the High School Team only. Wednesday chess is still in the cafeteria of course from 6:30-8:00 pm.